Loot Crate is a monthly subscription box for geeks and nerds. It has a variety of items that follow a monthly theme. The cost of the box is $13.95 plus $6.00 for shipping, bringing it to a total of $19.95. The value of the box is subjective so watch and read more reviews before you decide to subscribe. The March theme is Covert. I was expecting some cool spy themed stuff and I wasn’t disappointed. Loot Crate has been doing box designs for a few months with some being more elaborate than others. Past boxes had cut outs and diorama like set pieces. Last Months box was a board game board while this month has a computer design. 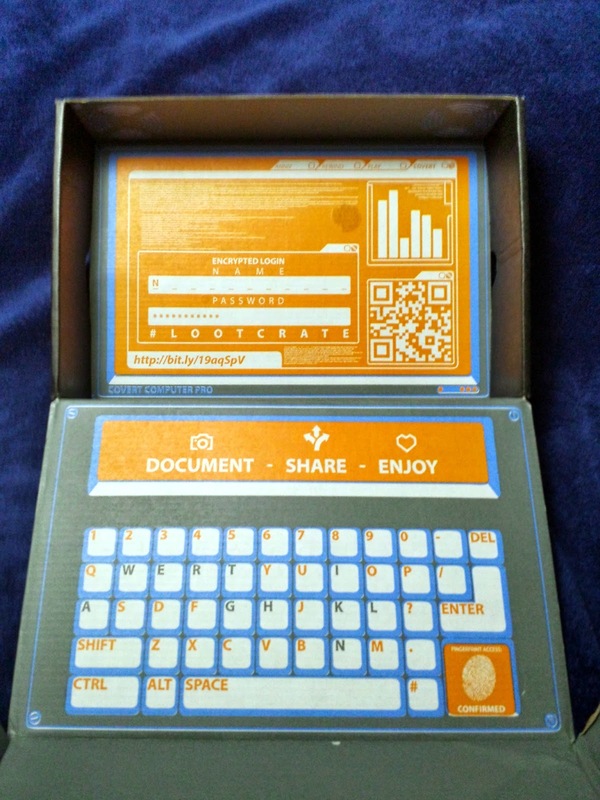 The box is actually a puzzle and the URL on the bottom left of the screen (http://bit.ly/19aqSpV) is a link that starts the puzzle. The puzzle has clues that requires you to look at all the things you got this month. At the end you submit your name to be a henchmen and maybe they give you something as well. This was fun and I hope they make more interactive boxes like this. This is one of my favorite shirts from Loot Crate. 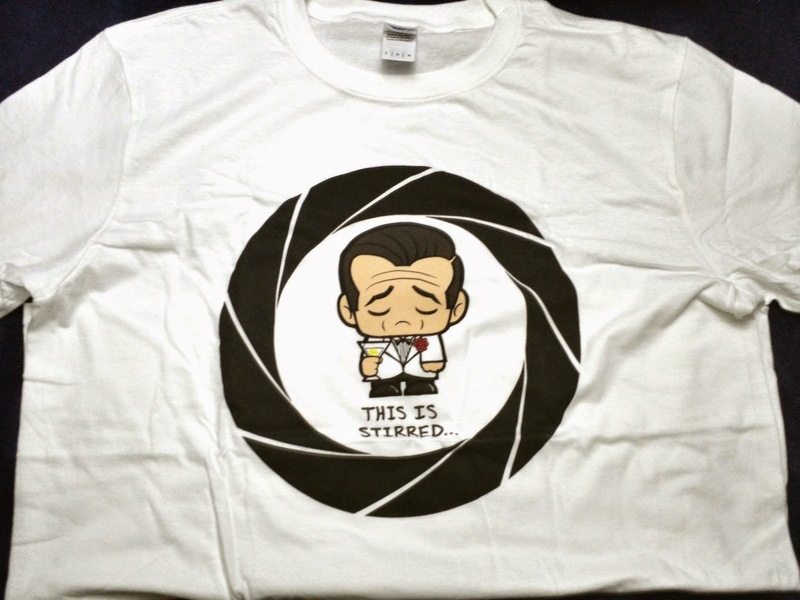 The whole “shaken not stirred” line from Bond is iconic. I will be wearing this as soon as possible. The spy gear is pretty cool. The watch has a blank face and doesn’t show the time unless a button is pressed. The Field Notes notebook is small and easy to carry. I will probably use this more since I prefer writing to using my cell phone. 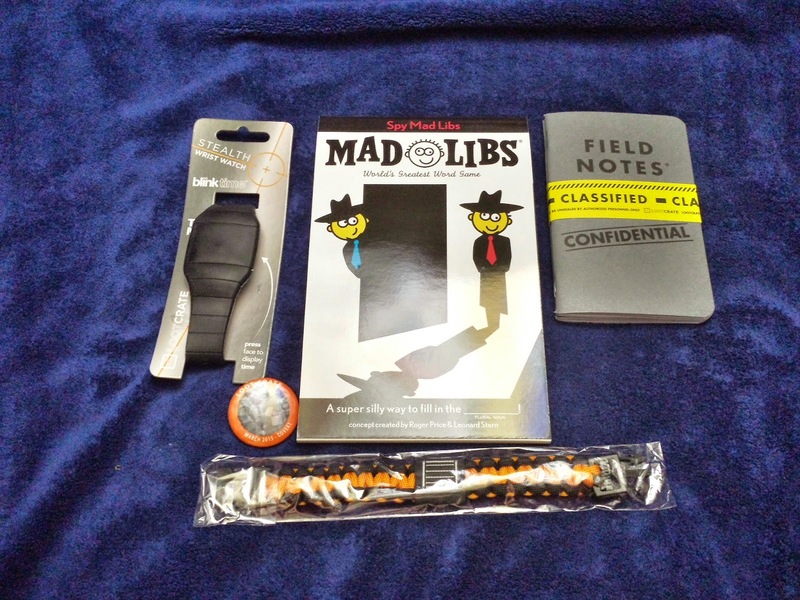 Also included is a paracord survival bracelet with the Loot Crate colors of orange and black. It’s a very useful item and hopefully I will not have to use it. I remember the Mad Libs games from when I was younger but I haven’t played a game in a while. I will probably play it with my younger siblings, it seems like a fun way to kill some time. 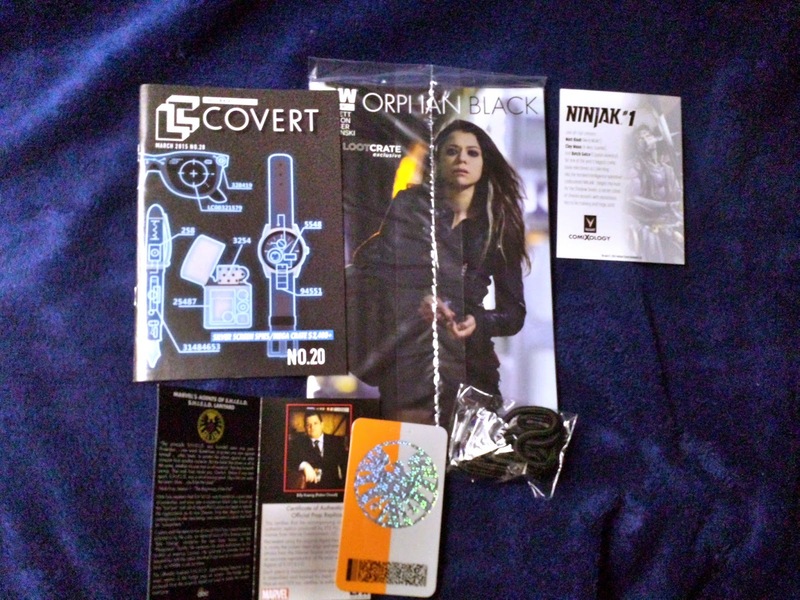 Two comic books and a cool prop badge are included as well. The Ninjak card comes with a code for a free download. I haven’t heard of the series but it looks interesting. Who doesn’t like futuristic ninjas? I haven’t heard of Orphan Black either. I think it’s a Canadian TV show and will have to do more research later. I hope the comic is a good read. The Agents of Shield badge is cool. I haven’t seen the show because of the bad initial reviews but I’ve heard it gets better during the mid season. I’m satisfied with the March Loot Crate. I liked majority of the items and the others were not that bad. I’m not sure about the Orphan Black comic but I will give it a read. The shirt and watch are sweet and will probably wear them often. The theme for next month is “Fantasy” so be sure to check the site for another Loot Crate review. If you want to sign up use this link, http://looted.by/bYcFC. Use the promo code SAVE3 for $3 off any subscription. I also get credit towards more Loot Crates if you use the link. If you have any questions, leave a comment at the bottom. Previous Article CrossFit Open 15.5: It’s Over!